I had a BS in chemistry and I was marrying a math professor. I realized that having a PhD in chemistry would make is difficult to find a job in the same place as my husband. Chemistry requires a PhD. I was always better in engineering so in 1.5 years, I got my BS in electrical engineering degree. Thirty-two years ago I answered an ad in the newspaper. I’m the Electrical lead on a rocket engine test stand at NASA’s Stennis Space Center. We test developmental rockets, not production ones and many times we are surprised at the results. 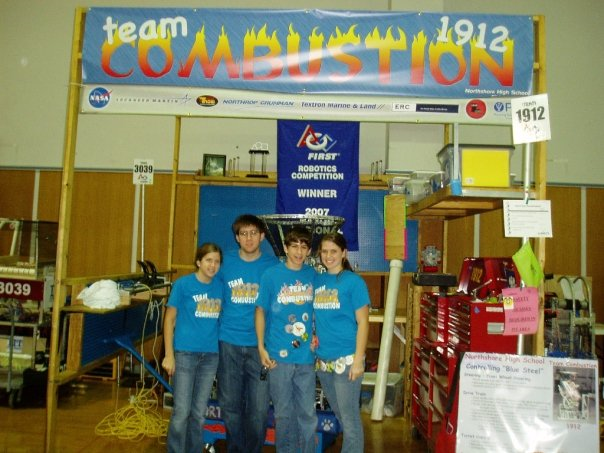 Going into the 2010 season, our team’s robot had been dead last two years in a row. I knew we couldn’t continue like this. I had a vision of remaking our team so that instead of being centered only around the robot, that we would center our FIRST’s vision and outreach. 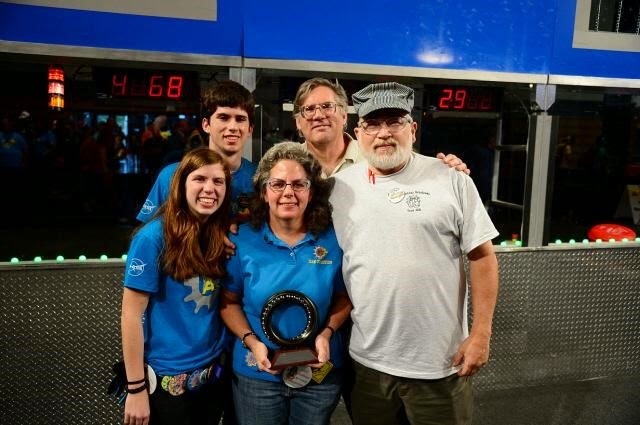 At that time, none of the other mentors on our team saw the importance of the Chairman’s Award and what it stood for. I actually got a lot of pushback. Winning the Chairman’s Award our first year (2010) was absolutely incredible but it was even better to watch the students as they won over and over again (2010-2013). It was after our first win that the entire team became incredible energized. There was a core group of students whose enthusiasm and dedication was not only contagious but inspiring. They all saw the importance of our outreach mission and went crazy with it. For me, it was awesome not only to watch the team transform but also to help the students as I saw them transform and grow. ● 33’s stinger in 2012. I’m pretty sure they were the first to introduce the stinger. Our drivers, when balancing, would always rock back and forth and it was so nerve wracking to watch. Then this team comes with a simple, elegant solution. The internet. I’m also especially attached to my Android phone and in terms of software I’m a fan of Google Apps, especially Gmail. With 4 children in college, it is the communication method for our family. ● Work: I use my NASA laptop with a docking station. In my office I have a couch, which I've had for most of my career. Also, as a gift from my daughters, near my computer sits a small WALL-E doll, which always reminds me that robotics should be fun. ● Home: Well lit, large two story living room, adjacent to my engineer designed kitchen, with granite counter tops and my black Kitchen-Aid mixer (best counter top alliance ever). No single use item. Upstairs a large bonus room, where many, many robot functions have occurred, Beta testing, training, team meeting, and robot builds. ● Robotics: We moved a new build space this year at the high school, the company whose facility we used closed. We are still adjusting to as it is arguably not as good as our old one. I truly loved our old space and dislike our new one. . I do not usually listen to music while I work. I go to work. Then I go home to make dinner. I cook every night. Then I go to build. A good meal is always worth making. Superb chef and baker. On numerous occasions I’ve cooked and baked for the team. I actually more remember the advice I didn’t take. Over the years I was often told I couldn’t do something. That I couldn’t have four kids, that I couldn’t be an engineer, that I couldn’t go part time, that I couldn’t start a robotics team. Over and over again, I was told I couldn’t do xyz and sometimes it was because women can’t do it. As I said, I didn’t take that advice and did it all anyway. -All 4 of my children were on our robotics team. My 2 eldest founded the team, my 2 youngest transformed the team. I now have 4 children in college, 2 in grad school, physics and robotics, 2 undergrad, 1 twin double majoring in computer science and robotics, other twin majoring in electrical engineering. 2 in California, 2 in Pennsylvania.